In case it matters, this post contains SPOILERS for the plot of CoD4. Playing Call of Duty 4: Modern Warfare right before bed might not have been the best idea. It’s the best first-person shooter I’ve seen–realistic locations with different approaches to most locations, engaging gameplay, and two ongoing characters: a Special Air Service commando doing covert operations in the former Soviet Union and a U.S. Marine fighting a revolutionary army in an unnamed Middle-Eastern country. In fact, the game is SO involving that it gave me nightmares last night. 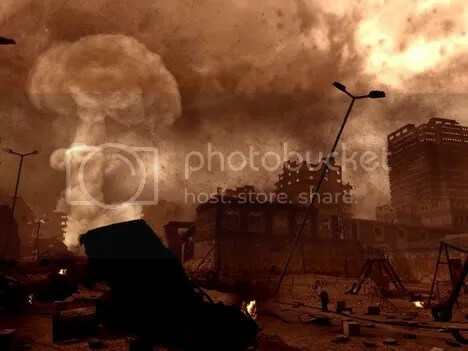 After a dozen or so missions in which your Marine unit fights its way through the streets to find the revolution leader with rogue nuclear weapons, your company is flying out of the city when THIS happens. Your character, the pilot you just rescued, the men you’ve been fighting with, the unnamed troops in helicopters all around–all dead in an atomic explosion. I’m very much a child of the Cold War; between a growing awareness of geopolitics, credulous belief in the Book of Revelations, distrust of Ronald Reagan and the string of hacks running the Kremlin, and The Day After, I worried about nuclear war more than most. Playing that game last night must have brought it all back. I don’t remember many details, just that a lot of my friends back in Louisiana were missing after an attack on Barksdale AFB, millions of people were dead, and the economy suddenly seemed like the least of our problems. Oddly enough I’m not at all down or depressed about it now. Waking up on a cool Spring day in a non-irradiated world put me in a good mood, and my everyday problems seem much less important right now than they did yesterday.